Chuck smiles for us in front of a banner listing Delta Deuts in sports. 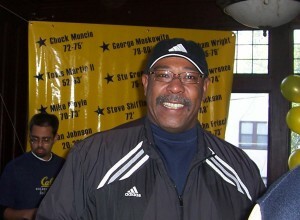 NFL Star, Cal Bear phenomenon, and Delta Deut brother Harry Vance “Chuck” Muncie is dead at the age of 60, as widely reported in the national media. A sad day for Delta Deuteron and all fans of the Cal Bears. At Theta Delta Chi a man is said to ‘enter the Omega charge’ when he passes away–joining all Theta Delts in the final chapter. Chuck lived at Theta Delta Chi and joined the fraternity, including completion of the ‘pledge quarter’ as part of a large pledge class of 14 men. We’re told he got the full pledge and initiation treatment. Despite his celebrity and national football successes, ‘Munce’ continued to visit the fraternity and often dropped by to hold court and hang out with the bros on football game days. Munce pauses to hang out with his pledge brothers and friends at his last Cal game. Chuck made it a regular habit to visit his fraternity brothers at their individual tailgates near the stadium. This photo taken at Big Game 2012, in Berkeley. A fierce competitor on-field, off the field Chuck was known for his ready smile, easy-going ways and slow reaction. You could not move him any faster than he wanted to move, smiling all the way. This entry was posted in Famous Delta Deuts and tagged famous, football, Muncie, omega by stratus. Bookmark the permalink.